TALK CLEAN TO ME: Eww! You have the FLU!! Eww! You have the FLU!! While Lee & I have not focused on specific diseases in our past blog posts, while getting my flu shot this week and noticing that the chair in my doctor’s office is covered with fabric that could not easily be cleaned or disinfected and that the exam table had most definitely NOT been cleaned or disinfected between patients I thought perhaps this week would be a good time to start. After all, it is flu season for many countries around the globe! Seasonal influenza (or Flu season as I like to call it) refers to the periodic outbreaks of respiratory illness in the fall and winter, usually between November and April. 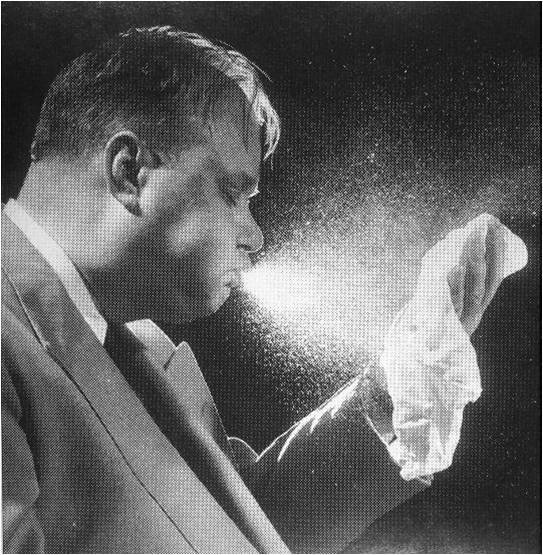 Influenza is an enveloped or easy to kill virus that is readily neutralized by disinfectants available today. The Flu is primarily spread through large droplets -picture your colleague that just sneezed or coughed without covering his mouth or better yet that close talker who is forever spraying you in the face while she talks! These droplets can directly come in contact with the nose, mouth or eyes and infect you. The upside is that large droplets can only travel a limited range, less than 6 feet so if you limit close contact you can limit the chance of getting infected. While to a lesser degree, influenza can also be spread by touching objects contaminated with influenza viruses and then transferring the infected material from the hands to the nose, mouth or eyes. High touch hand contact surfaces such as door knobs, light switches, telephones, keyboards, etc should be cleaned and disinfected frequently. I would also say that for Flu Season, the chair you sit on at Flu Shot clinics should also be considered high touch…do you know how many hands were on it before you sat down? During Flu season you can help stop the spread by cleaning and disinfecting your work areas before going on breaks, lunch and prior to leaving at the end of the day. Most importantly and the reason for today’s blog - GET VACCINATED! The annual Flu shot can help reduce your chance of getting seasonal flu by 80%. It also reduces the chance that you’ll make me sick and in my mind that’s worth it! Where for art thou Magic Bullet? Don’t let the wool be pulled over your eyes!